Overshadowed by the quartet of symphonies, Brahms’s two orchestral Serenades are not given the attention they deserve in the concert hall or the recording studio. 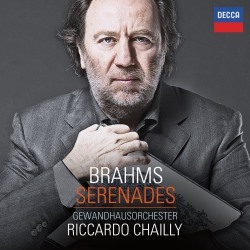 So it’s pleasing to have this excellent new recording from such an elite orchestra as the Gewandhausorchester Leipzig under its renowned Gewandhauskapellmeister Riccardo Chailly. Both masterworks of the repertoire the Serenades are early works composed in 1857/59 when Brahms was in his mid-twenties. The completion of the First Symphony lay some seventeen years in the future. Brahms wrote his Serenade No. 1 whilst in Detmold during a period when he had been studying Haydn symphonies and also working on his Piano Concerto No. 1. It seems that Haydn’s final Symphony No. 104 in D major was the model Brahms used for his D major Serenade a rather festive work of considerable symphonic length. Although Brahms was disappointed by the introduction of the six movement work in 1859 in Hamburg it drew considerable audience applause. One soon realises how conscientiously the Milan-born Chailly has prepared his Gewandhausorchester which shows in a smoothly controlled and entirely sympathetic performance. Especially attractive is the opening Allegro molto starkly evocative of the sights and sounds of a sunlit Tyrolean countryside scene. The fourth movement Menuetto I and Menuetto II marry a chamber-like elegance with immense subtlety. Written in 1858/59 the Serenade No. 2 is moulded in the tradition of the Haydn and Mozart serenades. At twenty-six minutes it is a shorter work, more mature in feel than the Serenade No. 1. Another major difference is its chamber orchestra scoring that includes double woodwinds and horns but excludes violins, trumpets, trombones and percussion. Dedicated to Clara Schumann, Brahms conducted the première of the five movement score in Hamburg in 1860 where it met with critical acclaim. In June 2014 at the Dresden Music Festival just a short time after this recording was produced at Leipzig I reported on a performance of the Second Serenade by these same forces. It was wholly captivating and my enthusiasm carries over to this recording. Chailly draws exquisite playing, enlivening the pulse and captivating the heart. I especially relished the sunny bucolic character of the inspired Adagio with its enchanting short passage for low strings. It’s hard to imagine the Second Serenade being played better than this. My first choice accounts of the Brahms Serenades have always been by another Milanese conductor. Claudio Abbado and the Berliner Philharmoniker recorded them in 1967 and 1981 in Berlin for Deutsche Grammophon but they have certainly met their match with this Chailly release. The Decca sound is clear and the balance and presence realistic. The appeal of this release would have been further enhanced by using up the available space with a contrasting contemporary work. Rihm’s Ernster Gesang and Ligeti’s Lontano are just two examples that spring to mind. Brahms’s pair of orchestral Serenades could not receive greater advocacy than these entirely convincing readings.